Marie-Joseph Paul Yves Roch Gilbert du Motier de Lafayette, also known as the Marquis de Lafayette, was born into an aristocratic family in France in 1757. At just 13 years of age, Lafayette was commissioned as sous-lieutenant of the Musketeers, a mostly ceremonial position in the French military. Lafayette worked his way through the ranks to lieutenant, a position he earned when he was 16. In 1776, delegates from American and France were negotiating a French involvement in the Revolution, and Lafayette was eager to volunteer. On December 7, 1776, Lafayette was enlisted into the Continental Army as a major general. Initial plans for French involvement came to nothing, but the young officer was undeterred and in June, 1777, he arrived in America to join the American cause. Congress officially commissioned him a major general in July. On his first meeting with General George Washington, the two bonded almost immediately, becoming a member of the General&apos;s staff. His first action came in the Battle of Brandywine, where he was shot in the leg. After two months of recovery, he received command of a division, assisting Nathanael Greene in reconnaissance of British positions in New Jersey. During the Valley Forge encampment, the Board of War asked Lafayette to prepare a plan to invade Canada, though there proved to be too few men to execute it. Lafayette would make a major contribution in May of 1778 during the Battle of Barren Hill. Lafayette&apos;s force of 2,200 encountered 6,000 British led by General William Howe just outside of Philadelphia. The British attempted to trap the Frenchman and his men, but Lafayette outmaneuvered them, feigning superior numbers while organizing a retreat. Years after the Battle, the area known as Barren Hill became known as Lafayette Hill. In October 1778, Lafayette asked leave to return home to France where he mustered 6,000 more soldiers to take to America. Returning to America in 1780, Lafayette was again placed in charge of a division of troops. His men were integral in securing British surrender at Yorktown in 1781. 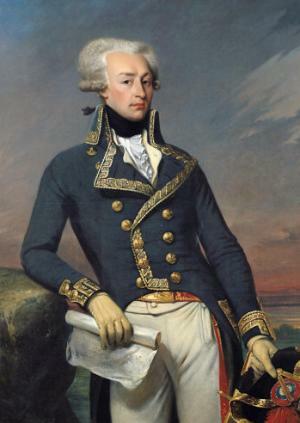 Lafayette returned home to France where he was placed in charge of the National Guard. The French Revolution led to a decline in Lafayette&apos;s standing as he opposed the radicals who were gaining charge of the country. Lafayette returned to the United States in 1824 with his son Georges Washington. He was hailed as a hero in New York, Boston and Philadelphia. Lafayette returned to his home in France where he passed away in 1834.